Features: MCU intellectually control the cooler fan and working status which prolongs its service life and helps to save the power consumption. Overload protection, overvoltage protection,low voltage protection,high temperature protection and output short circuit protection,battery reverse protection, total 6 kinds of safety protections. Intelligent and light-weight, convenient to carry and use. Adapted advanced chip technology, provides high conversion efficiency. Input and output are completely independent. 1 x DC12V 2000W Power Inverter(Body color may be different). Peak Power:4000W. Peak efficiency: >90%. Battery drain with no AC load(at 12 input):<0.3A. Applicable for resistive AC loads;. Full load efficiency:75%. Peak Power: 8000W. Model: 12V-220V 8000W. 1 x DC12V 4000W Power Inverter. •Modified waveform output. Wave form: Modified sine wave. Peak efficiency: >90%. •High conversion efficiency, smart soft start function. Features: Built-in fuse and cooling fan protections. With universal cigarette lighter plug, makes the power inverter can be plugged into almost any vehicle. It has low battery alarm, low battery shutdown, overload and short circuit protections. With USB charging ports ideal for charging devices with USB port. Ultra compact design perfect for you to use inverter on the road. 220V AC outlets for charging larger devices such as laptops and tablets. Universal design, suitable for 12V car or trucks. .
With this voltage converter you can use normal 220V / 230V / 240V electrical appliances in the car / boat / caravan or in your gardening. Please note that these inverters must be connected to a 12V battery. Brand 1handfair-deal Manufacturer Part Number Does not apply MPN Does not apply UPC Does not apply Featured Refinements Power Inverter Input Voltage DC 12V-24V Output Frequency 50 Output Voltage AC 200V-240V Continuous Output 600 W Peak power 1200 W Wave Form Modified Sine Shape Efficiency Frequency 50 Clip length 60 cm / 1.96 ft Car Charging Cable length 50 cm / 1.64ft Socket Type Australian Standard Size 190*100*60mm Package size 625*265*505mm. 24V TO 12V 40A DC DC Step Down Waterproof Converter. 480 Watt Inverter for Car Truck Caravan. You will get one 40 Amp Inverter as in pictures. 100% full stable output current. Surface mountable. Work for appliances from 0.5AMP to 40 AMP automatically. 1 x DC24V 4000W Power Inverter(Body color may be different). Peak Power:8000W. Peak efficiency: >90%. Full load efficiency:75%. High battery shutdown point(nominal): 32V. Low battery shutdown point(nominal): 19.2V. 1 x DC12V 4000W Power Inverter(Body color may be different). Peak Power:8000W. Peak efficiency: >90%. Battery drain with no AC load(at 12 input):<0.3A. Full load efficiency:75%. High battery shutdown point(nominal): 14.5-15.5V. 1 x DC12V 3000W Power Inverter(Body color may be different). Peak Power:6000W. Peak efficiency: >90%. Battery drain with no AC load(at 12 input):<0.3A. Full load efficiency:80%. High battery shutdown point(nominal): 14.5-15.5V. Pure Sine Wave o utput;. Pure Sine Wine. Wave form: Pure sine wave. 1 x DC12V 2000W/4000W Surge Pure Sine Wine Inverter. Surge Power:4000W. Peak efficiency:>90%. Battery drain with no AC load(at 12 input):<0.3A. Adapted advanced chip technology, provides high conversion efficiency. Protect the electrical and automotive circuits in use. High quality aluminum alloy case, antioxidant, sturdy and durable. Features: Built-in fuse and cooling fan for full protections. High performance and high converting efficiency. It has low battery alarm, low battery shutdown, overload and short circuit protections. 220V AC outlets for charging larger devices such as laptops and tablets. Ultra compact design perfect for you to use inverter on the road. Description: Durable metal housing provides advanced protections from drops and bumps. Aerpro FTS300P Pure Sine Wave 300W Inverter With USB Charger. For sale is a new Aerpro FTS300P Pure Sine Wave 300W Inverter with USB charger. Converts 12 volt DC to 220-240 volt AC. With this voltage converter you can use normal 220V / 230V / 240V electrical appliances in the car / boat / caravan or in your gardening. Please note that these inverters must be connected to a 12V battery. Brand goodgadgetsa Manufacturer Part Number MY09CU21665501 UPC Does not apply Featured Refinements Power Inverter Input Voltage DC 12V Output Frequency 50 Output Voltage AC 220V-240V Continuous Output 2000 W Peak power 3000 W Wave Form Modified Sine Shape Frequency 50 Clip length 60 cm / 1.96 ft Car Charging Cable length 50 cm / 1.64ft Socket Type Australian Standard Socket Type Australian Standard. 220V AC outlets for charging larger devices such as laptops and tablets. Built-in fuse and cooling fan for full protections. High performance and high conversion efficiency. Pure sine wave output is designed to operate popular power tools and sensitive loads. Aluminum alloy housing with oxidized and hardened process is extremely durable and stable. It has low battery alarm, low battery shutdown, overload and short circuit protections. Compact and lightweight design. This quality Pure Sine Wave Inverter was bought for a Caravan trip and never used. Wave Form : Pure Sine Wave. Continuous : 300W. It stayed in the caravan under a Seat. Input : DC 12V. Provide you for the convenience and comfortable using. Built-in fuse and cooling fan for full protections. Pure sine wave output is designed to operate popular power tools and sensitive loads. 220V AC outlets for charging larger devices such as laptops and tablets. It has low battery alarm, low battery shutdown, overload and short circuit protections. Aluminum alloy housing with oxidized and hardened process is extremely durable and stable. Universal design, suitable for 12V car or trucks. 240VAC, 50Hz (Pure Sine Wave). AS/NZ approved 240V sockets. Inverter designed to Australian standard AS4763. INVERTER CLASSIFICATION. NO LOAD CURRENT DRAW. 10.25 Volt. 40 minutes. IDEAL BATTERY SIZE. Peak Current: 950A. Battery Type: Lead-acid. 12v Output: 2 ports, 10A (Max 15A). USB Output: 2 ports (5v/2A). LED Flashlight: 2.5W. Battery Capacity: 12Ah. Pure Sine Wave o utput;. Pure Sine Wine. Wave form: Pure sine wave. 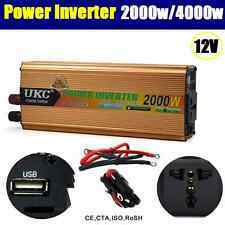 1 x DC12V 500W/1000W Surge Pure Sine Wine Inverter. Surge Power:1000W. Peak efficiency:>90%. Battery drain with no AC load(at 12 input):<0.3A. The IP600 includes a AS/NZS approved outlet, fused protection, easy bolt on wiring kit and remote LCD display. Made from a strong alloy hosing the IP600 can be mounted in almost any position in your vehicle, caravan or camper. 2000W Continuous (4000W Peak). 240VAC, 50Hz (Pure Sine Wave). AS/NZS approved 240V sockets. Inverter complies to Australian standard AS4763 (AS3001 ready). INVERTER CLASSIFICATION. RCD Protected Inverter. When you're on the go, a power inverter can harness the power of your car's battery to juice up other devices. These power converters can be quite handy if you need to use a laptop computer or even a gaming console in your vehicle. There are a few different types of DC-to-AC inverters as well as different inverter features to consider when you purchase one of these convenient devices. What Are Some Types of Inverters? You'll want to consider a few different power inverter types before you make your selection. These include a modified sine-wave inverter, a pure sine inverter and a square-wave inverter. These are essentially categorised by output, with a square-wave inverter being a DC-to-AC model that uses square waves instead of basic sine waves to produce output. A sine-wave inverter is a bit more complicated, but a pure sine wave adapter is the most complex type of inverter. What Features Do Inverters Have? Not all power inverters are the same, and you can choose how you want to run your power inverter by selecting a USB charger or one that goes into your cigarette-lighter adapter. Select the amount of voltage you require for input as well as output and one with features that include overheating protection and an on/off switch to conserve energy when you're not using the inverter.